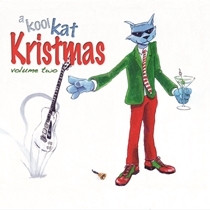 Have A Kool Kat Kristmas! Earlier this year we were asked to contribute a previously unreleased original in order to raise money for a good cause. Naturally, we agreed to do so and the result can be heard on A Kool Kat Kristmas Vol. 2 (Kool Kat Musik). “You Always Come Back Home (for Christmas)” is a song that we played live a few times but never really finished – Now we had a good reason to do so! You can listen to it and the rest of the songs on Soundcloud. A portion of the proceeds from the sale of each copy will be donated to The Susan Giblin Foundation for Animal Wellness and Welfare. The Foundation’s mission is to raise and dispense funds to support animal caregiving organizations, to foster awareness and education of complementary therapies, and to support the continued education of those in the animal medical field.